New Wiki article: "Three-fund portfolio"
(By the way... the "wiki way" is not to comment, but to "be bold" and go edit the article yourself Send a private message to Barry Barnitz if you want to edit the Wiki). I took a whack at the first couple of paragraphs, substituting my grammar and word choice for yours without making any substantive changes. The fun of a wiki is that you can go and change it all back if you don't like what I did. sscritic wrote: I took a whack at the first couple of paragraphs, substituting my grammar and word choice for yours without making any substantive changes. The fun of a wiki is that you can go and change it all back if you don't like what I did. I know improvement when I see it. Thanks! I added internal links, a link to a Vanguard research paper, a navigation template, cite footer, and temporary category designation to the page. I might state simply what a TFP is in the first sentence. "...is a portfolio consisting of one bond fund, one...."
From the Wiki:"It is often recommended for and by Bogleheads attracted by "the majesty of simplicity" (Bogle's phrase), and for beginners who want a little more "hands-on" control than they would get in an all-in-one fund like a Target Retirement fund." Actually, VG seems to be providing their own hands-on active management if the TR funds. If you want to set *your own* asset allocation and not have the %equities or % international ratcheted up every few years, then the 3-fund portfolio might be for you. “The only place where success come before work is in the dictionary.” Abraham Lincoln. This post does not provide advice for specific individual situations and should not be construed as doing so. Beagler wrote: From the Wiki:"It is often recommended for and by Bogleheads attracted by "the majesty of simplicity" (Bogle's phrase), and for beginners who want a little more "hands-on" control than they would get in an all-in-one fund like a Target Retirement fund." I take your point, I could go so far as to say I agree with it, but I don't see it as something for the Wiki article, certainly not the one on "Three-fund portfolio." I'm not sure exactly how much "sensible opinion" the Wiki editors will allow--one might imagine a "fair and balanced" article presenting pros and cons of the TR funds, but I don't think I'm going to write one myself. I personally held a Fidelity Freedom fund for many years and ditched it when it became clear they were winging it--in their case, changing the fund rules to allow for a bigger slice of "high-yield" bonds. My cynical off-the-cuff opinion is that all the target-date funds pretend to be exquisitely fine-tuned, long-term, scientifically validated instruments and in reality they are just consensus guesses that shift with the wind and the tide. Vanguard's "explanation" of the increase in international exposure is about as lame, marketroid, bland corporatese as one can imagine. "We've always said anything from 20-40% is equally good, and now Retirement funds are even more equally good as they ever were before." But still and all, just as I think there's a legitimate question as to whether slice-and-dice can be proved better than a simple three-fund portfolio, I think there's a legitimate question whether an individual investor managing a three fund portfolio can be proved better than just dumping it all into Target Retirement. Even with 15%-too-much stocks and all. I'm curious about the role of target-date funds. I know they were created well before companies were allowed to "default" 401(k)s. But I have to wonder if they weren't created for that very purpose, or in anticipation of such a rule. That is, perhaps the whole point of the Target Retirement funds is to give HR departments a way to pick funds for employees without risking a lawsuit. This would explain the use of the year and the rather strongly-worded prescriptions to "use the fund whose year most closely matches your planned retirement year." And there really is language like that, very specific. You almost expect them to tell you which way to round if you were born on February 29th in a leap year). I added sections on "Asset location" (which account gets which fund if your money is split between taxable and tax-advantaged -- mostly a link to the existing article) and "Combining funds" (what to do if your 401(k) doesn't offer a total stock market fund). sommerfeld wrote: I added sections on "Asset location" (which account gets which fund if your money is split between taxable and tax-advantaged -- mostly a link to the existing article) and "Combining funds" (what to do if your 401(k) doesn't offer a total stock market fund). I added internal links to WIKI pages on approximating Total Markets and glide paths to the narrative. Many of you have expressed confusion over how WIKI works. As this page demonstrates, a page is best built when editors collaborate on a page. You can grasp this by looking at the page history. 2) You prefer a mix not available in a TR fund. Wanting to be more "hands on" doesn't seem a great reason. Apologies if this was covered. Total Stock Market, Total Intl Stock Index, and Total Bond Market. Very nice Wiki regarding three-fund portfolio! Simplicity is a beauty. I add the link to the Wiki's three-fund portfolio in my signature from now on. Desired stock/bond/cash allocation is easy. * Place Total Bond Market in a tax-deferred account. * In taxable accounts, high-income investors may substitute a tax-exempt bond fund for Total Bond Market Index Fund. Keeping VG's "hands off" the asset allocation is a major advantage. The investor can set the AA and know it won't be manipulated every few years, as has been the case with VG's TR funds. Let's assume you want to add another stock fund representing 10% of your equity allocation. This will require a portfolio stock allocation of $30,000 to meet the $3,000 Vanguard minimum. With a 50% stock/50% bond allocation, we are talking about a $60,000 "larger" portfolio. Before adding funds, Vanguard investors should also consider that three total market index funds will achieve low-cost Admiral status faster than slice & dice. Nice Wiki page. I couldn't log in there, but I can here. It seems (no specific reference) that the 3-fund port as described generally fits those in the accumulation phase. You might note that Vanguard's Target Retirement Income fund is comprised of only 6% International Equities, thus there is a broader range than noted, with lowest percentage likely intended for those drawing down their accounts or living off them. elgob.bogle wrote: Nice Wiki page. I couldn't log in there, but I can here. It seems (no specific reference) that the 3-fund port as described generally fits those in the accumulation phase. You might note that Vanguard's Target Retirement Income fund is comprised of only 6% International Equities, thus there is a broader range than noted, with lowest percentage likely intended for those drawing down their accounts or living off them. Vanguard also plans to increase the international equity exposure of Vanguard Target Retirement Funds, Vanguard LifeStrategy® Funds, and Vanguard STAR® Fund from approximately 20% to approximately 30% of the equity allocations. I really like this in dept discussion of the three fund portfolio. The article lets the investor select any particular allocation using the three funds. It is not just 1/3 of each. There are examples of how to achieve this portfolio not just using VG but also Fidelity funds. It makes the investor aware that VG Target Retirement Funds use a fund-of-funds investment approach utilizing these same three funds. In other words VG by using these same three funds is implicitly recommending them. When you come down to it though, this three fund portfolio is the same as the first of Schultheis's "lazy portfolios",as listed in the wiki. Right now this is the last paragraph of the wiki article started by nisi. On the other hand, three-fund portfolios are simpler than the genres called "Coffeehouse portfolios" (William Schultheis's term), "couch potato" portfolios, or "lazy portfolios", which are intended to be easy for do-it-yourselfers but are nevertheless slice-and-dice portfolios using six or more funds. The quote seems to gloss over the fact that "the three fund portfolio" started by nisi is at its core the same as the first "lazy three fund portfolio" by Schultheis in the wiki. It seems to me that the article started by nisi is a very excellent and very helpful expansion of the 'lazy three fund portfolio'. I may do a bit more later..
idahospud wrote: When you come down to it though, this three fund portfolio is the same as the first of Schultheis's "lazy portfolios",as listed in the wiki. ... The quote seems to gloss over the fact that "the three fund portfolio" started by nisi is at its core the same as the first "lazy three fund portfolio" by Schultheis in the wiki. This is the first I heard that Schultheis had endorsed a three fund portfolio. There is no attribution for this. Even if this is so, it is not what Bill is currently advocating. Ignore the market noise. Keep to your rebalancing schedule whether that is semi-annual, annual or trigger bands. I own a targeted retirement fund because I don't want to manage the allocations myself. Why is this implied as a disadvantage? The domestic-to-international ratio change was perceived as welcome and long overdue. I like the idea of the three fund portfolio. I note all the positives mentioned. BUT what are the downsides? Has any studies shown whether adding reits, small, etc has had a SIGNIFICANT higher return over 20 years or longer? antiqueman wrote: Has any studies shown whether adding reits, small, etc has had a SIGNIFICANT higher return over 20 years or longer? 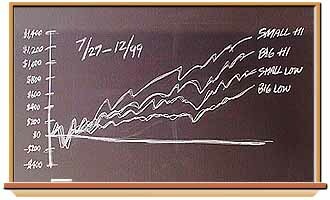 Several, the most significant was authored by Eugene Fama and Ken French in 1992. It's the basis of their three factor model where small and value are unique risk factors. I have a chart summarizing French-Fama return comparisons on my website. You can find many others elsewhere on the internet. bob90245 wrote: Several, the most significant was authored by Eugene Fama and Ken French in 1992. It's the basis of their three factor model where small and value are unique risk factors. As you stated, the 1992 paper (link) concluded that small and value stock performance could not be predicted. It never stated that you would have better performance. A subtle point, but I thought to mention it. I didn't read it that carefully. But what about, in taxable investments, for those in highest tax bracket, subsituting one's own state's long term bond fund in place of the total bond market index fund. I like the Simplicity of everything. I only check my account to see if it was credited with the amount I just wired and the read this forum. Nothing else. I hope that I can "tune out the noise" & "stay the course" during the next big down turn. My stomach has not been tested yet. According to bob90245 Bill Schultheis would probably not claim that the lazy three fund portfolio listed in the wiki as his, actually is his. Maybe a wiki mistake? Schultheis suggests a starting point for investors is a total stock market index fund. He adds a total bond market and a total international stock market fund to the mix. "There are a lot worse things you can do than investing through a three-index-fund portfolio," Schultheis said. This may not be a ringing endorsement of a 'three fund portfolio' but according to Schultheis it is a 'starting point' and many investors could 'do a lot worse'. Those comments ignore history. From when I first discovered Bill Schultheis and his Coffeehouse Portfolio several years ago, he was after more diversification than what was available from large growth stocks that were all the rage in the late 1990's. Many investors did in fact did a lot worst by chasing the hot sectors that drove up the Total Stock Market with unsustainable high returns. This is why Schultheis included ignored sectors (which at the time were lagging) like value, small and REITs in his Coffeehouse Portfolio. Those comments ignore history. From when I first discovered Bill Schultheis and his Coffeehouse Portfolio several years ago, he was after more diversification than what was available from large growth stocks that were all the rage in the late 1990's. Many investors did in fact did a lot worst by chasing the hot sectors that made up the Total Stock Market. This is why Schultheis included ignored sectors (which at the time were lagging) like value, small and REITs in his Coffeehouse Portfolio. Here is a link to the Schultheis three fund portfolio (to be exact, this is an ETF portfolio): Kirk Report:Bill Schultheis' Coffeehouse Portfolios. I will update the wiki to footnote this reference. Hmm... Well, it looks like I'm on the losing side of this argument. I, for one, do not have a short memory. In my previous plan, I tried the simple approach persuaded that TSM was all an equity investor ever needed. Then I got badly burned in the 2000-2002 meltdown. So I switched to the Coffeehouse Portfolio in order to avoid the mistake of putting all my equity eggs in one basket (Large Growth TSM). LadyGeek wrote: I own a targeted retirement fund because I don't want to manage the allocations myself. Why is this implied as a disadvantage? The domestic-to-international ratio change was perceived as welcome and long overdue. Not all investors want the sort of fluid asset allocation that VG's TR funds are apparently providing. In particular, the ratcheting up of the %equities a few years ago comes to mind (really messes up the age=bonds). And using the TFP you can set your own int'l allocation. (Didn't VG just bump its int'l allocation by 50%? Is that what every TR fund investor wants?). With a TFP you can roll your own and be sure it won't be changed on you. bob90245 wrote: Hmm... Well, it looks like I'm on the losing side of this argument. Not at all! With WIKI, having verifiable sources is fundamental and you helped bring this detail to light. "if you can't bother to do it right, this is probably good enough," which I think is a connotation of the phrase "lazy portfolio,"
"Not only is this good enough, nobody can prove anything is actually better... so this is better because it's simpler." Another subtlety is that if you're opinionated enough to be concerned with the size of the (irritating) tweaks Vanguard makes in its Target Retirement portfolios, maybe you're opinionated enough that you wouldn't really be a candidate for a mix-it-yourself three-fund portfolio... you'd care enough to want TIPS or REITS or small value. In any case, the average 401(k) investor would be a lot better served by sticking to one domestic stock fund, one international stock fund, and one bond fund... as opposed to "Oooh, a buffet, I want some of that Magellan soup and some of that Contrafund salad and some midcap brownies and International Small Value REIT cookies and I want my portfolio to be large and to grow so let's have a slice of that Large Growth, and, mmm, 'High Yield,' I like the sound of that..."
P. S. Wouldn't you love to know how many 401(k) investors split their contributions up equally among every fund offered, including every target-date fund? Well, I have the flip side of the "buffet" analogy. In the late 1990's, the fad was to be a vegatarian (load up on the hot sectors that drove up TSM). However, I felt sluggish. So I went for a doctor visit to see Dr. Schultheis. He recommended that I needed more variety in my diet like meat, chicken and fish (value, small and REITs). Sure enough, my health (and portfolio) improved! Then today, I see that Dr. Schultheis has been saying that being vegatarian is good enough, plus it's a simple diet. You don't need meat, chicken and fish in your diet (er, portfolio). It gave this patient very mixed messages. I don't think I can go back to being a vegetarian since it wasn't good for my health. Tilting: This thread has me thinking (not for the first time) that it would be worth 'formalizing' some variant of Trev's SB&H on the Lazy Portfolios page, or the Slice and Dice page, a new '5 Fund Portfolio' page, etc... I see a lot of folks get 'stuck' trying to slice and dice out every last thing, when a simple few-fund approach can work instead but still provide a tilt - e.g. adding SCV to TSM can accomplish something quite similar to LCB/LCV/SCB/SCV. Not to derail this thread, but I'm open to suggestions on where to go with this. Small vs. Big is obvious. But, does "Hi" mean "Hi growth", where Low means "value" ? realitytruthprozac wrote: But, does "Hi" mean "Hi growth", where Low means "value" ? Just the opposite. "Hi" refers to high book/price ratio, which means that "hi" is value.